I've had the most amazing weekend and my cup is POURING over so y'all are going to have to bear with me because I want to share about the people I spent my weekend with and that includes a zillion pictures (you will probably recognize a few of these people!). 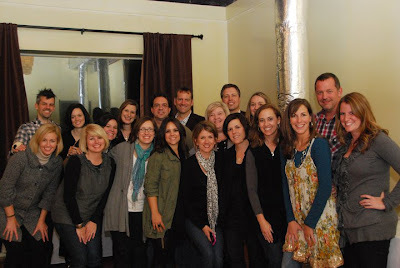 So I headed south to Birmingham this weekend to attend Deeper Still and hang out with a group of Compassion bloggers. And it was just as fun as I thought it might be. I met a WHOLE bunch of "y'all" and that was so fun!! Thanks for saying hi. I will never get over meeting complete strangers who say "I prayed for Harper when she was born.". I don't think you have any idea what that means to me! My first surprise was running into my friend Kristin. She came with a group from her hometown. Laurie and I used to teach a College Girls Bible Study back in our younger single days and Kristin was one of our girls who we loved. I haven't seen her in YEARS so I was thrilled to get to spend some time with her!! This is Steve and Patricia and their daughter Isabel. They both work for Compassion and have three amazing daughters. I have told Patricia that I would LOVE for Harper to turn out like her girls. This family has a heart for missions and Isabel (who is 11) - has started her own ministry called Shoes for Kids. She collects shoes for kids in poor countries who needs shoes. She's ELEVEN! To say I think she is amazing doesn't begin to cut it! The conference was Friday night and all day Saturday. I loved getting to spend time with Heather, Amanda and Sophie. Heather and I were lucky enough to stay at Sophie's house on Friday night and we had the best time! I got to know Jessica through Angie Smith - they are friends in real life and I was so excited to have the chance to meet her. She is also expecting a baby so it was fun to compare toddler/pregnancy notes! So this is probably the worst picture of me ever but I love Angie so much I posted it anyway because of course she looks super cute. Angie is one of my favorite people ever and I was so glad to see her. She was a busy girl signing books and doing lots of things so we didn't get to hang out much but it was nice just to see her sweet face! Probably one of the highlights of the weekend for me was getting to meet and spend time with Amanda. We have read each other's blogs for a long time and I feel like I've known her forever. Our daughters are a month apart and she is such an encouragment to me when I read her honesty about mothering. She is even sweeter in person and I just wish we lived closer and could get together more often! My hostess for the weekend and probably one of the funniest people I know. I ADORE Sophie (boomama). I have read her blog almost since it started and sometimes I feel like we are the same person. ha! I had the MOST fun with her this weekend - I was so sad for it to end. Melanie (big mama) stayed with me and Sophie last night and we all stayed up WAY too late talking and laughing. She is one of my favorite people ever! We slept in this morning and then ate a DELICIOUS lunch at Chuy's and then she and I headed to the airport and I was so glad we had time to sit at our gates and talk more. I could talk to her for hours - she makes me laugh SO HARD! Last night we had a dinner with all the compassion bloggers. It was SUCH a fun time. This was my group that went to El Salvador. I will never ever forget that trip as long as I live. It has had a huge impact on me and I love each of these who went. Keely (LOVE HER), Patricia, sweet Molly, Heather, Dan (who you might remember was in Haiti when the earthquake hit and his hotel collapsed and he was in an elevator shaft with several days and he used his iPhone to help him survive. AMAZING STORY! ), me and one of my favorite people- Shaun Groves. The whole Compassion group - seriously BLOWN AWAY that I get to spend time with all of these people - they must not know I'm just a girl from Arkansas who didn't have a date to the senior prom. ha! Here's the thing - I spent a lot of time talking to these people about blogging and just what a crazy world it is. I started a blog just to write about my family and it is still SO surreal to me and bizarre that anyone reads it and that through my blog I have had the chance to go on a Compassion trip or to meet all these AMAZING people that I would have never known before. This weekend I got to meet in person Kay Arthur (and all I could muster out of my mouth was "I like your boots" ..............one of the most wonderful Bible Teachers in the world and that's what I had to say?) and Beth Moore (who was so amazingly sweet and I wanted to take my picture with her but I was TOO chawed). There are a lot of negative things that can come with blogging but the GOOD far outweighs the bad. I may get a handful of mean comments from time to time but hearing precious, encouraging words from the majority of you and getting to know people that I would have never had the privilege of knowing before has been SUCH a blessing to my life. I think Sophie summed it up the best (and I have laughed about this non-stop) last night - she, Melanie, Heather, Amanda and I were sitting in a car because we were early for dinner just sharing and talking and laughing and she said "Who would ever have thought I'd be sitting downtown Birmingham with a car full of people I met on the internet?" I never would have thought it either but I'm SO thankful God has allowed my path to cross with so many of you!